With the advent of plastics it has become fashionable to erect plastic covered greenhouses to grow produce, often at great expense because of the high cost of the metal that must be used to support the plastic. Apart from the disproportionately high cost, plastic is not the right material to use in hot high humidity areas such as on SA’s Eastern seaboard. The sun’s rays penetrate the plastic (radiation) and the inside of the tunnel becomes intolerably hot. If water is used to cool the tunnel down then the resultant humidity level becomes unacceptably high for the plants. Transpiration cannot take place effectively and diseases, especially fungal diseases, proliferate. Often, the humidity can rise as high as 95%. Even if no water cooling is used the moisture contained in the plant can contribute to a high humidity level with just the same outcome. No growth takes place at temperatures above 30 deg.C. Seedling Growers have been using gum poles and shade cloth since their very inception and still do to this day. Most often the method of growing is hydroponic which means that seedling growers have long chosen a system that most ideally suits the plants. Shade cloth is cool (varying occluding percentages can be used to suit the % shade cover desired) and allows air movement within the greenhouse which lowers humidity levels. DaisyFresh Greenhouses are built with gum poles and shade cloth to achieve maximum benefit from lower temperatures and air movement. In addition however, other materials are also used to achieve a cost effective method of growing fruit and vegetables. 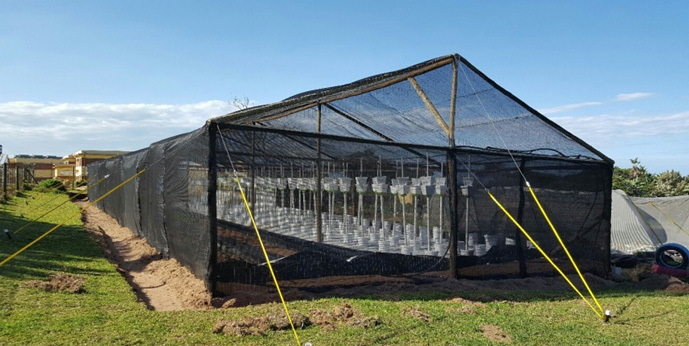 Dual extruded PVC sheeting (black down, white up) is used to inhibit weeds and reflect as much available light within the greenhouse for the plants’ use, without any heat being introduced into the growing area. In addition and wherever possible, the Verti-Gro system is used which results in 6 times the number of plants being grown in the same area. Thus in a 100m2 greenhouse that could normally accommodate only 500 plants, with Verti-Gro it could accommodate 3 000 plants. This makes the operation highly cost-effective. Under normal circumstances a mixture of fruits and vegetables cannot be grown in a single hydroponic greenhouse because each plant requires a different EC (Electrical Conductivity that measures the strength of the nutrient solution). By grouping certain veggies together DaisyFresh is able to arrive at two groups that can be fed two different EC nutrient solutions respectively, but in parallel. The nutrient solutions are kept separate throughout the feeding maze by means of two separate header tanks and separate feeding and drainage plumbing systems. Time clocks are used to control the respective feeding times which can also be different when necessary.